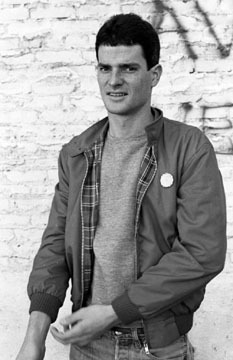 Kjehl Johansen played bass in Narrow Adventure at the same time he played guitar for 100 Flowers, and he had previously been the guitarist in The Urinals (both bands included bassist John Talley-Jones). After departing Narrow Adventure, Kjehl continued with 100 Flowers. Later, he moved on to Danny & The Doorknobs (featuring early Wednesday Week producer Vitus Mataré), which mutated into Trotsky Icepick, again with John Talley-Jones. Currently, Kjehl is a solo artist on Kelly Callan's Avevury Records. Photo by John Frank.